Many insects own a tessellated carapace with bumps, pits or indentations. Little is known on the physical properties of these geometric variations, and biological functions are unknown or still debated. Beetles from the genus Chrysina show vivid reflections from bright green to metallic silver-gold as a consequence of the twisted (cholesteric) liquid crystal organization of chitin molecules. Fig. 1. A story of advanced mirrors.—The carapace of scarab beetle Chrysina gloriosa includes two kinds of mirrors: a mosaic of wavelength-sensitive micromirrors in the green stripes and a flat broadband metallic mirror in the silver stripes. 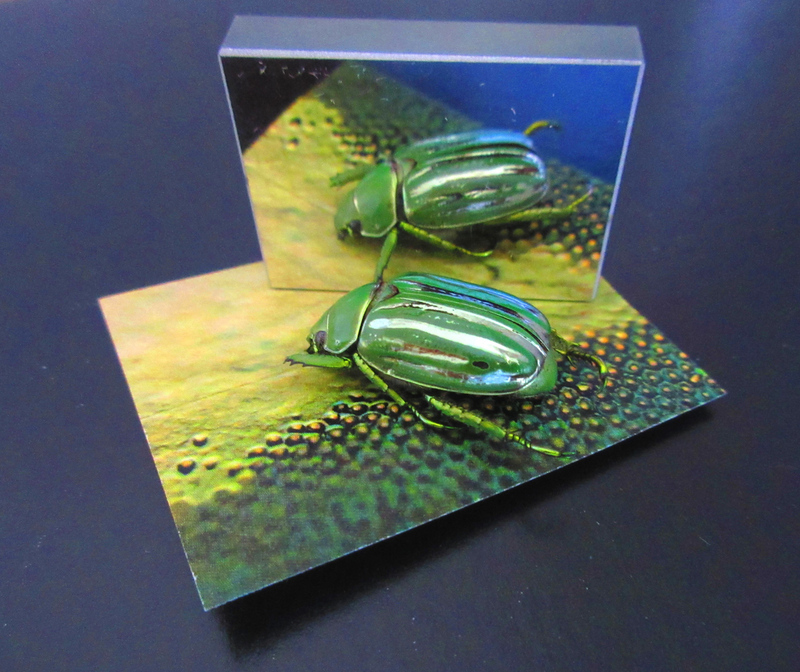 In this paper, my co-authors and I focus our investigations on the carapace of Chrysina gloriosa, which exhibits green and silver stripes (Fig. 1). 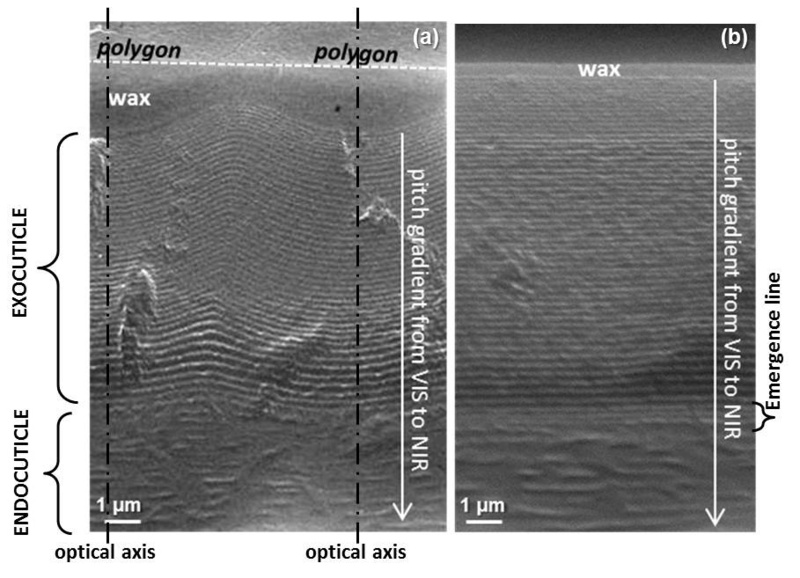 By combining confocal microscopy and spectrophotometry, scanning electron microscopy and numerical simulations, the relationship between the reflectance over the visible and near infrared (NIR) spectra and the structural parameters for both stripes at the micro- and nanoscales is established. The twisted structure of chitin molecules in both stripes exhibit pitch gradients, in ranges of comparable amplitude. However, the orientation in space of the helicoidal structure varies in the green stripe whereas it is fixed in a silver stripe (Fig. 2). The carapace of C. gloriosa displays several optical phenomena: (1) the green stripe serves as a wavelength-selective (green) optical diffuser due to the set of polygons arranged on a curved surface; (2) the green stripe is a wavelength-selective mirror; (3) the silver stripe plays the role of a flat metallic reflector operating over the visible spectrum and into the NIR spectrum; (4) the endocuticular part of both stripes are characterized by a broad reflection in the NIR-IR spectrum due to a graded-pitch CLC structure with no tessellated texture. Previous literature has inferred that the polygonal cells of C. gloriosa were structurally and optically analogous to the focal conic domains formed spontaneously on the free surface of a CLC film, on the basis of similarities between optical textures. It has been possible for us to correct this inaccurate hypothesis. The main conclusion on this issue is that the carapace has concave cells whereas the artificial films have convex cells. Fig. 2. Scanning electron microscopy images of cross-sections of the carapace in (a) green and (b) silver stripes.—In a green stripe and below each polygon the so-called ‘fingerprint texture’ presents concave nested lines. In contrast, the lines are regularly parallel in a silver stripe. The distance between two lines of equal contrast is related to the helicoidal pitch of the twisted structure, while the helicoidal axis is perpendicular to the lines. Our results may provide valuable insight into how such phenomena could be exploited in the living world. We hypothesized several functions: (1) Conspecific or intra-species communication: the green stripe displays information (color, polarization) in the visible spectrum and NIR spectrum; the wavelength-sensitivity of the reflection pattern, occurring essentially in the visible spectrum, may convey this information by being related to the spectral sensitivity of eyes of C. gloriosa conspecifics and predators. (2) Thermoregulation: NIR reflector may regulate temperature. (3) Camouflage against diurnal predators (green diffuse reflection) or nocturnal predators capable of detecting IR light since many green insects show a high NIR reflectance close to that of their habitat foliage; in addition, the shiny surface would mirror the green color of its environment and, during the dry season, the beetle could hide among the same leaves when they are brown. (4) Survival: the bright glare from silver stripes might temporarily blind a potential predator, enabling C. gloriosa beetles to escape. (5) Navigation, if it is proved that a crepuscular and nocturnal insect like C. gloriosa use NIR or IR wavelengths for such a purpose. Our contribution may learn about the fabrication and design of photonic devices. The light reflection by C. gloriosa cuticles, with a variety of wavelengths and spatial patterns, may provide inspiration for fabricating spatial wavelength-sensitive light modulators and optical packet switching in routing technologies. Multiwavelength micromirrors in the cuticle of scarab beetle Chrysina gloriosa.